Cannon has the expertise to see your project from concept to finished parts. Cannon capabilities extend from computerized CAD/CAM design tools to a organizational focus on design-for-manufacturability. 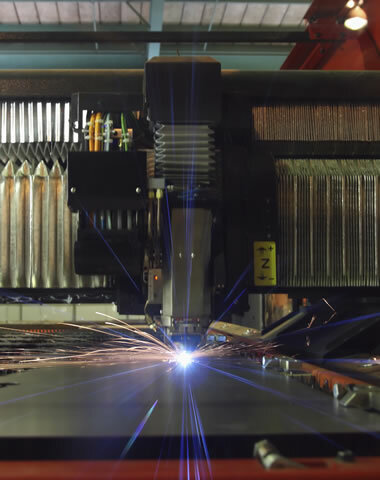 From the initial drawings to the execution of high volume production parts, Cannon Industries Sheet Metal Fabrication operation creates the precision products your manufacturing process requires. Cannon’s computerized operation begins with our computer aided design (CAD) and computer aided manufacturing (CAM) software. Our CAD/CAM software is among the most versatile, up-to-date packages in the market. With this software, our engineers can produce detailed drawings even when deadlines are tight which minimizes the need for changes and corrections. When plans are completed to your specifications, the design moves to our production line, where the Mazak laser table gives us the power to cut steel, aluminum, and other materials to the tight tolerances that you need for your precision pieces. The most intricate parts are cut using the AMADA CNC Coma, a 44 station Turret Press with two auto index stations for highly accurate and reliable punching. For bending metal, Cannon is at the ready with our AMADA CAN fine benders, available in several sizes to accommodate the final part size or configuration that your assembly requires. Finally, our sheet metal finishing line uses MIG, TIG and spot welding for stainless steel, cold rolled steel, and aluminum. Cannon can handle your fine finishes as well with painting, silk screening, irradiating, and phosphating services available at your request. Turret Press: 44 Station Turret, 22 Auto Index Stations. Brake Press: Fine Bender, 50 ton, 4′ Capacity with NC back gage AMADA NC Model RD-100, 100 ton, 8′ capacity with AMADA NC back gage *Also available, 20 ton, 6′ capacity press. AMADA RD-80, AMADA RD-50, Warcom Futura 100 ton 10′ Bed, Warcom 240 Ton 14′ Bed. Punch Presses:	from 45 to 300 ton units all with cushions, coil underwire, and straighteners. Additional capabilities: Inserting System Cut off Saw with Auto Bar-feed, Journeyman Band Saw, Lathe Wet & Dry, Timesaver Finishing Machines, CAD/CAM.